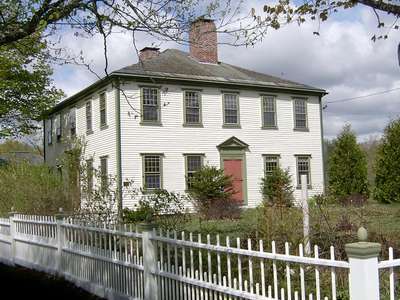 The Archibald-Adams House, built in 1793, is one of the oldest houses in Cherryfield and has been placed on the National Register of Historic Places. This classic foursquare Federal home at 122 Main Street was built by Thomas Archibald in the then “modern” New English Adam style, and although this was also the style of the highway taverns of the day, this mansion was constructed as a family home and housed Archibalds, Adamses and Campbells and their Celtic-American descendents until the mid-1900s. Like most old houses, this one, locally known as the Adams House, underwent renovations and updates over the course of two centuries that reflected new ideas and modern technologies. Not all these “improvements” were kind to the house. Then in the 1990s the house fell into loving and knowledgeable hands and its original conservative post-revolutionary interior decoration was restored. A modern country kitchen was added, fireplaces were once again exposed and the house was returned to its original colonial splendor. It seems entirely fitting that the house is once again in the hands of a person from the British Isles, Englishman Peter Winham and his wife Kathy. The Winhams met in England on an archeological dig and lived on the plains of South Dakota for twenty years where they worked at their profession and raised their family. It was the desire for a change of geography that prompted them to consider moving to New England. As a teenager, Kathy had lived in Connecticut and now, as an empty-nester, she wanted to return east. She had little trouble selling Peter on the idea. After a fruitless search for archeology positions, they began an Internet search for a place that would provide both a home and a living. In the autumn of 2004 they visited the Adams House on the last day of looking at possibilities in Washington County. The house spoke to their archeologists’ hearts and in January of 2005 they moved in with Mickey, the friendly house cat, and boxes and boxes of “stuff,” but little furniture. Then began a crash course in period decorating and the work of creating a unique Bed and Breakfast. Like native Mainers, the Winhams use the side entrance and stepping into the Englishman’s B & B is like stepping back in time, with subtle differences. The house is furnished with antiques and period pieces culled from local shops, auctions and estate sales. Quality reproductions fill in the gaps and touches of chinoiserie, as might be found in any such stately home in a New England sea-faring village, strike just the right note of sophistication, restrained elegance and country charm. The guest lounge originally served as the Archibald’s formal parlor and later as Judge Joseph Adams’ courtroom. In the closet museum one can see the judge’s court log book documenting in his own handwriting what transpired there between 1819-1835. The book has pride of place in the collection of relics on display and was reportedly found under a floorboard in the attic when the house was renovated in the 1990s. A complete history of the house is available for perusal over a cuppa, for here in the lounge guests are also treated to tea in the English tradition. Officially, tea is served to guests who arrive by five o’clock, but being English, Peter can be persuaded to make tea at almost any hour. Teas of Cherryfield is another new venture for the Winhams and dovetails nicely with the Bed and Breakfast business. They distribute gourmet teas at wholesale and retail and serve the fresh-brewed beverage to their guests along with a variety of elegant teacakes, including the scones and Eccles cakes for which Peter’s native land is justly famous. Being in Cherryfield, the Wild Blueberry Capitol of the World, one is not surprised to find blueberry pound cake and blueberry muffins on the teacart as well. In the Keeping Room, guests may choose a complete English breakfast – a hearty offering of eggs, bacon, sausage, fried tomato, baked beans and fried potatoes – or just about anything else they may desire. The Winhams aim to please and “since we’re small, we can take personal care of guests preferences,” they say, thinking perhaps of customizing their service to provide just what the guest requires, including, but not limited to, catering to special diets, providing car service or taking guests to places of special interest. They hope to develop services that will fill a niche market and are presently feeling their way along to discover just what their particular niche will be. It could be as simple as providing a front row seat for watching bald eagles fishing on the Narraguagus River that runs behind the property. The original twelve-over-twelve windows in the spacious guest rooms provide spectacular views of the river and in autumn and winter, eagles can often be seen perched in the bare trees waiting for supper to swim within range. In warmer weather, both the veranda that runs around half the house and the screened gazebo out in the yard provide inviting venues for just settin’ a spell with a cup of tea and a good view. Especially agreeable guests might even get to see the old Post Office – now part of the proprietor’s quarters – for the Winhams are nothing if not enthusiastic about their new role as custodians of this museum quality national landmark and their new and very welcome venture in historic Cherryfield. For more information visit on-line at www.englishmansbandb.com and www.teasofcherryfield.com or call 207-546-2337.